– Western Libraries, February 2016. David is available for presentations to your community organization, group or bookstore. Please contact us at royaltern@outlook.com for details about a speaking engagement and to schedule an event. The multi-media presentation, The Miracle of Life at La Jolla Cove—based on David Sattler’s award-winning book—captivates the audience with spectacular and intimate images of the wildlife that call La Jolla Cove home and the gorgeous coastal landscape meandering along the Pacific Ocean. 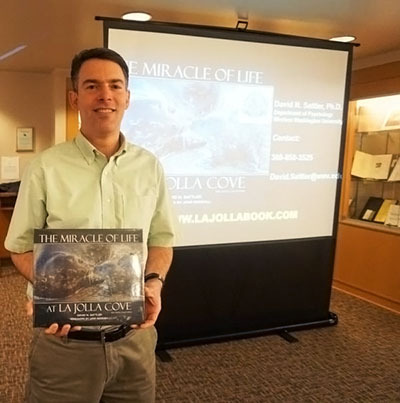 David discusses the development of the La Jolla Underwater Park (an ecological reserve), and past threats from which marine species are recovering and current threats that can comprise the health of the marine environment. An experienced and dynamic speaker, David Sattler regularly presents engaging presentations to community and professional organizations and academic institutions on a variety of topics. Examples include San Diego Coastkeeper, La Jolla Riford Library, Village Books, Western Libraries, Rotary Club, National Science Foundation, U.S. Customs and Border Protection, Seattle Business Forum, Washington State Senate Higher Education Committee, First Congressional Church, the Boy Scouts of America, and high schools. He received the Action Teaching Award from Social Psychology Network.